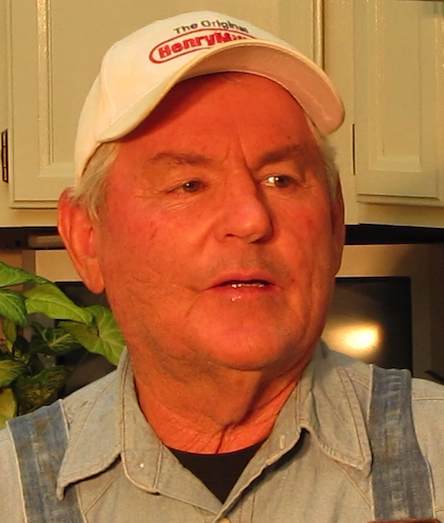 A very common question I get from Henry Milker customers is: "How do you make goat cheese". 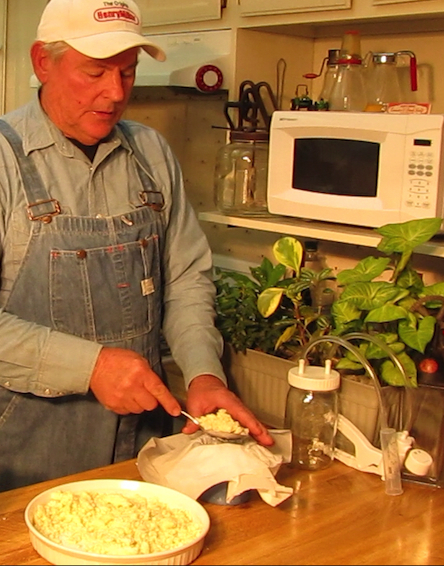 I have had this question asked so many times, I asked my brother Cy to reveal his Henry family recipe for making goat cheese. 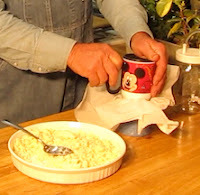 It's and old recipe but it is not very difficult to follow and it provides instructions to make perfect cheese every time. Few ingredients and basic cooking equipment is all that's needed. I use 1 gallon of goat milk, seasoning, apple cider vinegar, a pan, wooden spoon, and a clean towel. Pour the gallon of milk into the pan and heat on high until the milk just begins to boil. 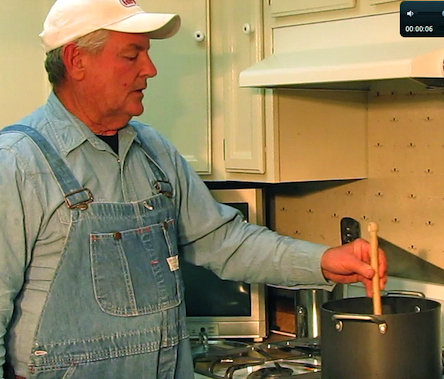 To avoid scorching the milk, constantly stir with a wooden spoon. Right at the time the milk begins to boil, add 1/2 cup of apple cider vinegar and continue to stir. Curds should form immediately. Pour the entire mixture into the open towel and drain. 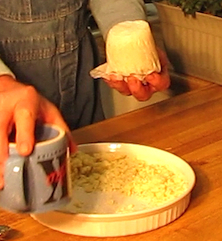 Squeeze, press and do anything you can think of to get as much moisture out of the curds as possible. 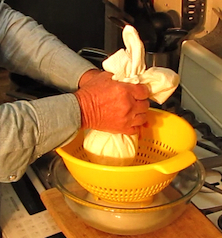 Spend some time on this step, it will pay off with a better cheeses that is not watery. 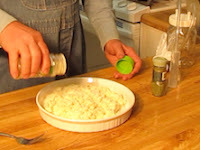 Remove the curds from the towel and place into a container so you can separate and add your favorite seasoning. Garlic, dill, and salt are the ingredients in this batch of goat cheese. Get creative! Forming and pressing the cheese is the next step. I like to use a large coffee cup lined with parchment paper for the mold. Fill and find something you can use to press and push the cheese down to make a firm block. I use another coffee cup (Mickey) as my cheese press. After pressing, turn the cup upside down and there you go, a block of cheese. This is ready to eat now but should go into the refrigerator for a day to cure and take on all of the seasoning flavors. 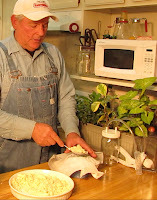 See the YouTube video on Cy Making Cheese. 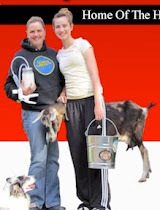 More breeds of dairy goats, take a look. 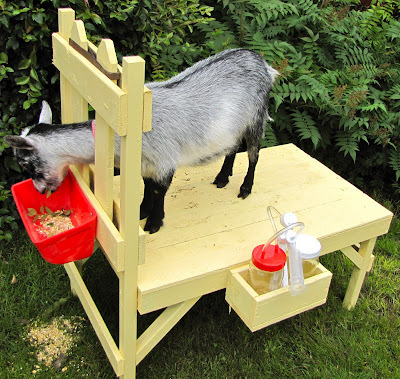 Other Goat Cheese Making kits and ideas. Ah geez... I wish I would have known this when I was milking Frosty!!! You make it sound very easy.. thanks for sharing! 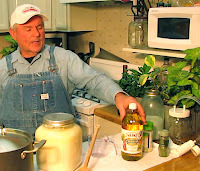 Hi Christine...Cy says it works just fine with "whole cows milk bought at the store". Would be fine to try. just made this about 5 min ago, minus the garlic and dill (just didnt have any dill and thought just plain garlic sounded sad so I just added salt) it looks kinda chunky...this is my first cheese making attempt...not gonna lie, it stinks (: but I will taste it tomorrow to see if it tastes better than it smells. Hi, and good luck. the cheeses probably will not taste any better than the milk tastes or smells. 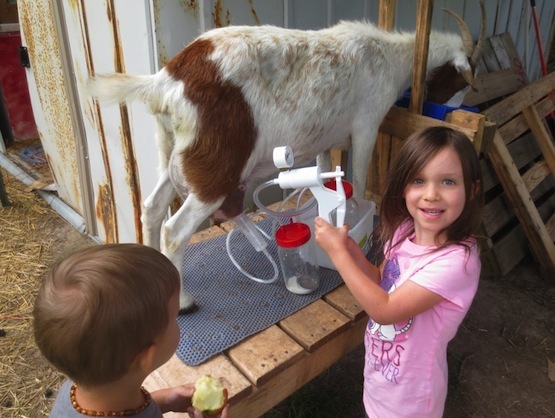 does your fresh goat milk have the same odor? Dear Daughter, I mean niece Jenny. This blog was completed and posted without the technical assistance of Phoebe, she just returned from a trip to MI. I could not wait to show her my blog entries while she was gone. She spent most of the time correcting my spelling, she did catch this one. I'm not a very good speler but often tell a good storry. I made cheese this way for years, also used lemon juice in place of the vinegar. I usually didn't bother to press it just shaped into a round. We never had stinky milk or cheese. If you have a milk odor/taste;look at the browse they have access to,cleanliness at milking, quickness of milk chilling or make sure if you have a truly smelly buck he is well away from the girls. I just poured the vinegar into the milk that was almost boiling and nothing happened. It got all foamy but isnt think or anything. How long do I leave it on the stove to cook and does it need to cool to form the correct amount of curds? I think you got the milk too hot....it is important to stir all of the time and have the vinegar ready to dump in at the exact time that you see the first boil bubbles, pour the vinegar in and keep stirring. Thanks for your nice comment, I'll pass it along to Uncle Cy Henry. I just made my first cheese!!!! Made from fresh alpine goat milk. It smells wonderful - just like goat milk :) I did add the garlic, dill and salt. Can't wait till tomorrow to try it! Thank you so much Henry. 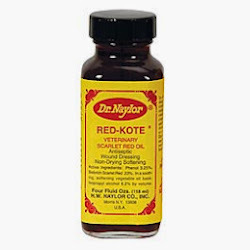 What other seasonings do you use? Do you slice the cheese or use crackers? What would happen if I didn't heat the goat's milk? I have raw goats milk and the point of having dairy products raw is that I want the enzymes and probiotics preserved. Heating it will destroy them. I am looking for amounts of garlic and dill and other flavouring suggestions. Can't wait to try it!!! ii not getting any curds .turn it off letting it cool .will it form curds as it cools or do I just throw it away.